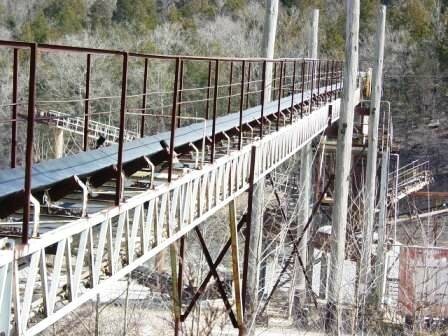 Mechanical conveyors are used in a variety of industries, including mining, drilling and quarry operations. The flexibility of conveyors also allows them to be used for various purposes, and nearly any job site can be organized with the use of conveyors. One of the most common uses of mechanical conveyors is carrying solid materials from one location on site to another. This flexibility is no doubt part of the reason these devices are so popular in quarries, as well as in mining and drilling operations. Conveyors can also make transporting goods on site or loading vehicles to transport finished products or materials to market or another processing facility a simpler option. The ability to repurpose the same piece of equipment for handling different types of material is a definite advantage. Another benefit of using mechanical conveyors is that they can be easily adapted to the layout and needs or different plants and operations. It is not uncommon for mining and quarry sites to be rearranged over time based on changing needs, and conveyors can be easily adapted as the situation at your project location changes. Conveyors also provide a cost-effective approach for material handling at many sites. Transporting bulk materials like ore and aggregate with a conveyor is often much less expensive than it would be to transport the material with trucks or other equipment, especially in the early stages of processing where larger raw material is sorted and refined into different usable products. Rackers Equipment Company maintains a large inventory of reliable used and new mechanical conveyors. Our diverse selection of equipment will suit nearly any project need. Our inventory is updated frequently, so you may want to check back from time to time or contact us if you don’t see the exact configuration or option that you’re looking for. Rackers Equipment is your source for new and used mining and aggregate equipment in the Missouri area, and we have been proudly serving the equipment needs of our customers for more than two decades. Nothing is more important to us than connecting our customers with the right equipment for their needs. To learn more about our services and inventory or to request a quote on a new or used mechanical conveyor, call us today at 573-635-8700.